Designed to leverage the capabilities of the CR-Series Check Transport devices, ImageChex Express Lite by C&A is the logical replacement for costly microfilm systems. Without the need for expensive database engines, it offers a truly affordable turnkey solution to automate the capture, search, and retrieval of check image data. As a result, organizations can streamline operations, improve customer service, and explore new marketing opportunities, while boosting profitability. With a simple intuitive, Windows® interface and using the familiar Microsoft® Explorer format, users can quickly and easily manage data with minimal training. ImageChex Express Lite offers a modular design and flexible set-up options for customized integration to meet a wide range of business requirements for electronic check imaging. Canofile for Windows Software connects all phases of the document lifecycle; scanning, storage, retrieval and printing; through a powerful Windows-based PC solution. A solution so versatile, it can be utilized in stand-alone or networked office environments and effectively manages all your files. 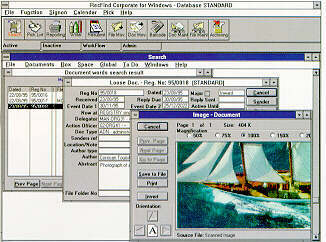 The Canofile for Windows system is a powerful tool to capture and retrieve archived documents. Rapid, flexible search and storage parameters like namable Index Cells enable users to customize the system to conform to the specific needs of any business. And the user-friendly interface lets users navigate the system effortlessly, organizing scanned documents by Page, Document, Cabinet, Disk, Library and Database. In networked environments, files may be shared between a server and client workstation, saving time and space while increasing filing productivity. imageWARE Enterprise Management Console delivers a streamlined, centralized point of control for all devices installed across your enterprise. Its expandability helps to speed the correction of error conditions by directing low toner, paper jams, and device maintenance alerts via e-mail messages to the network administrator. imageWARE Enterprise Management Console offers advanced automated task management including retrieving/distributing device settings, rebooting devices, retrieving/distributing address books and discovering new devices. imageWARE Enterprise Management Console is a foundation for future innovation due to its distinctive framework, and is designed for easy implementation and simplified expandability. In order to meet the various requirements of the marketplace, there is a range of RecFind products to suit any organization no matter how large or small. All versions are easily upgradable, so your investment will always be protected. GMB offers an extensive set of training and consultancy services including data conversion and data take up. RecFind is delivered with a comprehensive warranty. Thereafter, GMB offers a variety of support contracts ranging from simple telephone support to a complete service including updates. Our first customers from a decade ago are still with us because we provide the best support in the industry. Customer support is the first priority. Also see the Canofile for Windows and Colorflex.